Early Mist Farm – The record books of the N3TC Drak Challenge in partnership with FNB were re-written on Sunday as Andy Birkett recorded his sixth consecutive title while Abby Solms continued her dominance of the Southern Drakensberg classic by winning an unprecedented eighth Drak crown. The two races couldn’t have been more different with Euro Steel’s Birkett having the privilege of a two minute buffer going into Sunday’s final stage while Solms and her Euro Steel team mate Jenna Ward were separated by just a few seconds. In the end it was the class of Birkett that shone through and he cruised home to a five minute victory. 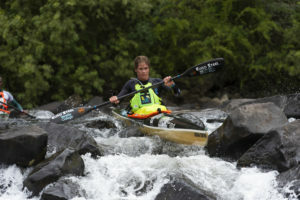 With his win, Birkett is now the most successful male paddler at the Drak Challenge equalling Ant Stott’s mark of six titles. 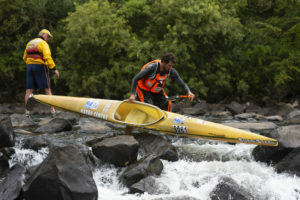 “I don’t do this for the records, I come to Underberg to have a jol,” the laid back champion said. “I have said it in the past but this is definitely my favourite race on the calendar, no matter what the conditions are. Coming home in second was local Euro Steel/Varsity College youngster Stew Little. “I definitely had a few glances over my shoulder today to make sure that Stew wasn’t catching me,” Birkett added. “He has been doing a lot of tripping and knows the river better than anyone so I was a bit concerned. 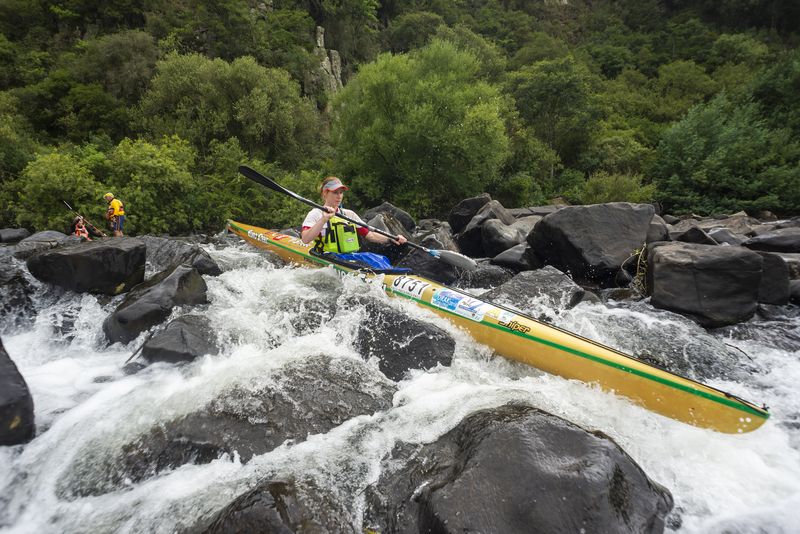 Little, who won the Under 23 age category, lead Euro Steel’s Siseko Ntondini across the line by just under 20 seconds and with this result Little has announced his arrival at the sharp end of South African paddling. “Andy and Hank (McGregor) are still in a league of their own and Hank was really unlucky when he put a hole in his boat but I hope that in the future I can fight it out with them. “Hank caught me in the first six kilometres of the day and I felt like I was going backwards! For Ntondini it was a strong result finishing on the podium. He was followed home by birthday boy Alan Houston in fourth and under 18 age category winner David Evans in fifth. The ladies race was wide open going into the final stage on Sunday with four women with a realistic shot at winning the title, however Solms was lurking just a few seconds behind Ward and the pressure was on the defending champion. Despite not being at her best, Solms showed her class and experience in the technical sections to pip Ward right at the death in an exciting end-sprint. “It was very difficult for me, usually I feel a lot more comfortable,” the eight-time champion said. “Even the flat sections were low so the girls couldn’t pull away from me so I pulled on the front of the bunch and I knew that it would be more difficult for them on my wave. Ward had to settle for second place and despite Bridgitte Hartley putting in a monumental effort she couldn’t reel in Ward or Solms and finished in third. In the Under 23 age category contest it was race runner-up Little who took the honours ahead of Alan Houston in second and Maswenkosi Mtolo in third. Euro Steel/Varsity College’s Christie Mackenzie was the strongest Under 23 lady, and finished fourth in the ladies race overall. Winning the Under 18 boys prize was Maritzburg College’s David Evans. He beat Matthew Fenn and Sam Butcher, who finished second and third respectively. The Under 18 girls crown went to Caitlin Mackenzie with Amy Peckett finishing second and under 16 rising star Georgina Howard in third. Michaelhouse’s Matthew Millward was the first Under 16 boat over the line and Georgina Howard was the first Under 16 girl home.